There are various factors that influence the price of a weighted blanket. But why do them cost so much? You need to look at the quality of the material or fabric used, the type of filler, size and weight of the blanket, manufacturing and manpower, packaging, and shipping costs, and most importantly, the time involved in making each one, are all pricing factors. Naturally, a considerably heavy item such as this takes time and attention to detail, and is quite awkward to handle during the manufacturing process. Thus, it takes much longer to make than a smaller consumer item would. If the production was easy and fast, the final outcome wouldn’t end up having a great quality (that happens with many cheap weighted blanket manufacturers). And many more conditions that cause difficulty to sleep or variable amounts of anxiety and stress. How much does a weighted blanket cost on average? 1 How much does a weighted blanket cost on average? 2 Is a Weighted Blanket Worth its Price? Browsing the web, it’s clear that you’re spoilt for choice. Ok, I’ve mentioned that prices vary for certain reasons, so let’s weigh up the costs involved for the most common factors. Custom designs range anything from $94.95 to $124.95 for small-not-so-heavy sizes. Is a Weighted Blanket Worth its Price? I say YES! Any investment in your health is worth its cost in my opinion. Especially when you are buying something that is obviously going to last longer than 40 tablets of valium, and have about the same cost. Considering all the materials needed, time and effort involved, not to mention the various health benefits of such a product, it’s definitely worth every cent. Having said that, even if you’re not treating any conditions or ailments, and simply looking to get a good night sleep to help you function better during the day, the investment is priceless. Especially if you love your sleep as much as I do. When you use a heavy blanket, various things happen in your body. Our folks from Healthline1 wrote a useful article on weighted comforters and their therapeutic treatment of anxiety, where they briefly explained that using them creates a grounding effect that helps to calm the body and lower stress levels by reducing the production of stress hormone “cortisol”. The blanket also provides the same effects as DPT or deep pressure touch therapy. A kind of physical therapy which applies hands-on pressure to reduce anxiety and stress. The release of dopamine and serotonin in the brain is also stimulated relieving the body of the effects of stress and helping you fall asleep but also stay asleep. This is achieved by reducing the movability and chances of tossing and turning during the night allowing your body to rejuvenate itself more effectively. Now, unless it breaks for some reason, a good quality weighted blanket can last you a lifetime while other types of treatment can cost thousands of dollars over a long period of time. 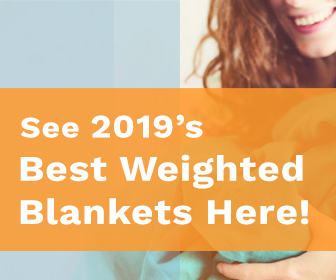 Ok, I know what you’re thinking, that this blanket sounds like the best thing since sliced bread, and to some people it sure is, but it certainly is not a miracle cure for all your aches and pains. You should always consult your physician if you suffer, or think you may suffer, from any of the conditions I mentioned here. Let’s take a look at some alternative treatments for these health concerns. Medication is usually the first choice for most people, but they can be very costly, especially if used on a regular basis. There are over 13 known medications to treat Autism. One of which costs a whopping $940 per month. That is a yearly average of $11,280. Over a 25-year lifespan, you’re looking at $282,000. Without other therapies, housing and support. Anxiety meds can set you back $80 to $120 per month. Sleeping tablets are $17 to $60 per week, and dementia medication, $200 to $400 per month. You get the general picture here. I won’t dig too much deeper. It’s clear the costs can add up to staggering amounts. If, however you do consider taking any medications, always consult your Physician and look at the possible side effects. The availability of herbs, teas, tinctures and spices to aid in the treatment of these conditions are endless and much cheaper than medication. Relaxing chamomile tea is a mere $5 a box depending on where you buy, and lavender essential oils around $10 to $25 per bottle. Other natural remedies include consuming coconut oil, cayenne pepper, MSM supplements, Vitamin C and D, B- complex, Omega 3, 6 and 9’s to mention a few, and naturally, they are not as expensive. Acupuncture is known as a treatment for an endless list of ailments including Autism as well as lots of kinds of injuries. It’s important to know that multiple treatments may be required per week, and can range anywhere between $75 to $95 for an initial consultation and $50 to $70 thereafter for regular treatment. Nothing beats an old-fashioned healthy diet and exercise routine. Staying well hydrated by drinking a lot of water, clear broths and herbal teas will help flush your body of harmful disease-causing toxins. It makes it easier for your body to focus on its natural processes when it does not have to apply extra energy on breaking down heavy starches, and refined carbs and sugars. Ensuring you get all the macronutrients from organic foods on a daily basis will help your body naturally boost its immune system, balance hormones, stimulate cognitive function, aid in cellular regeneration and more. This will help your body deal with the symptoms of these conditions. Apart from all this, there is also a very exclusive stem cell treatment available for Autism, but the price is unknown. I can only imagine that it would be quite high. Other social and behavioral, educational and family therapies are also available. The costs of these alternative treatments will greatly depend on your physician and where the rehabilitation will be completed. Please understand that what I’m trying to tell you here, is not that weighted blankets are going t make you avoid your conditions entirely and get you away from medication, avoiding having to work out or having a balanced diet (whew! I wish!). The way I see it; anything that can help you out, in the long run, and that seems like it could make up for reducing the use of medication even if it’s just by a little bit, while at the same time making you feel nice and comfortable, is at least worth a shot isn’t it?